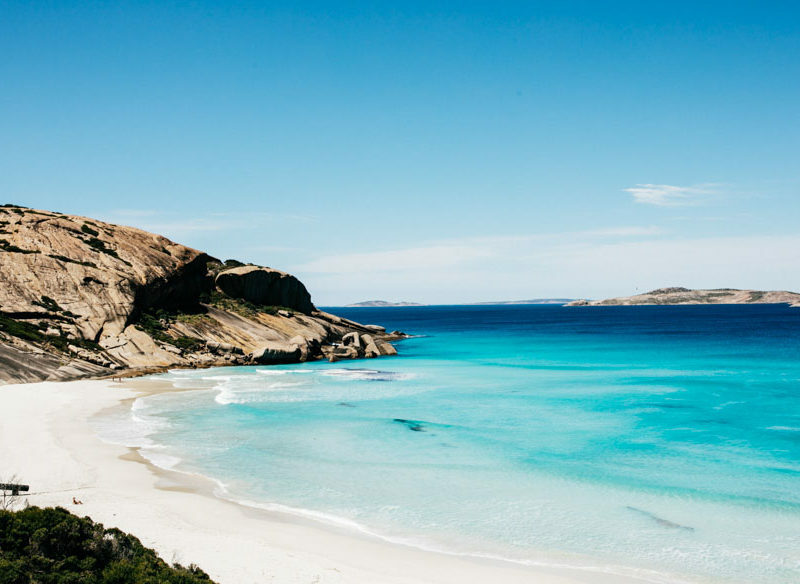 The pristine beaches of Esperance (photo: Elise Hassey). On part 3 of her Golden Outback road trip, Jenny Ringland eases into Esperance. There, she finds breathtakingly beautiful beaches. Another day, another drive filled with majestically contrasting landscapes. We arrive in Esperance to a shock of icy-white beaches with water cascading from royal blue to creamy pastel lapping the shoreline. I breathe it in; being near the ocean brings instant happiness every time. We head out of town towards Cape Le Grand National Park, home to Lucky Bay beach and its whiter than white sand. The park is 56 kilometres from Esperance and spread over 31,801 wildly, barren hectares where bushland crashes into the most turquoise water you’re ever likely to see. We brave the sheer rock face of Frenchman Peak, scrambling for 45 minutes to reach a cave at the top where Mother Nature has kindly created a window in the rock face. It provides sweeping views of the park and out past the granite shoreline. Exploring the beaches, our favourite is Little Hellfire Bay, accessed via a 20-minute walk along a dirt track. It’s windy here at Cape Le Grand, and today it’s Little Hellfire that’s protected. Back in Esperance, Heather Gee reflects on what makes her adopted home town so unique. “I think it’s the isolation and (because it’s incredibly pristine) it’s a very special, beautiful place,’’ says Heather. She and her husband, Steven, arrived in 1966, hungry for opportunity. They now run a B&B overlooking West Beach. Eating there: The Loose Goose Restaurant & Bar – Cosy and unassuming décor teamed with beautiful food. 9A Andrew Street, Esperance.